Don’t you know that you yourselves are God’s temple and that God’s Spirit dwells in your midst?~1 Corinthians 3:16. If you are a born again believer, then you are the temple God resides in. He is omnipresent. Meaning God can be in more than one place at the same time. His Spirit resides in those who are born again. He takes up residence in us. We see a body. When we look at people we see flesh. Yet we are more than flesh. We are body, spirit, soul (mind, will, and emotions). They are all connected. The Spirit empowers the body. The spirit, our human spirit, is purified at conversion. We are told to be led by the Holy Spirit. The body (flesh) is not perfected. The soul is being renewed, transformed, and made more like Christ. Scripture to support this. 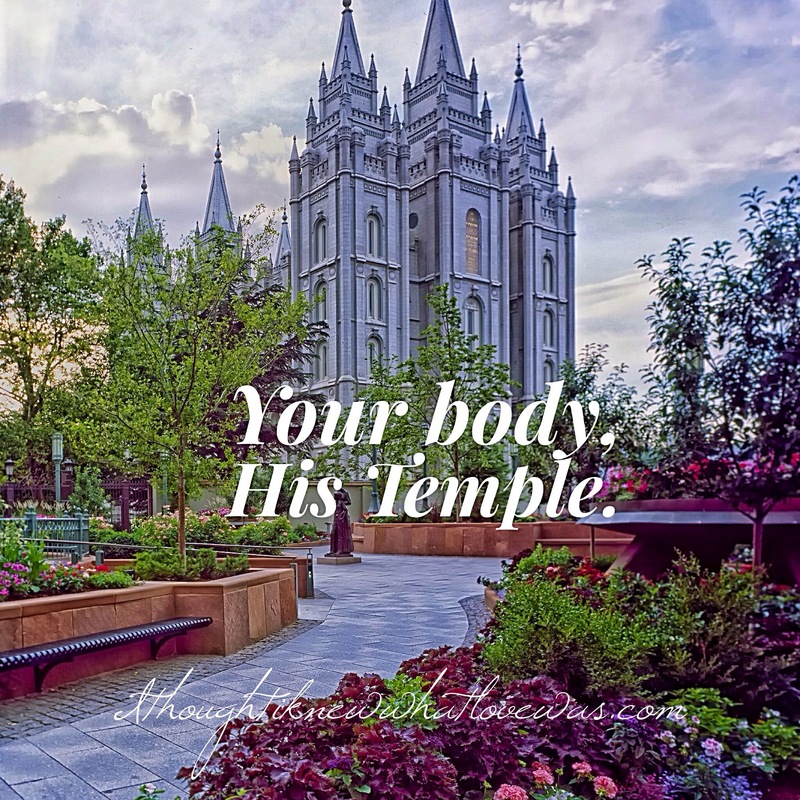 I urge you, brothers and sisters, in view of God’s mercy, to offer your bodies as a living sacrifice, holy and pleasing to God—this is your true and proper worship. Do not conform to the pattern of this world, but be transformed by the renewing of your mind. Then you will be able to test and approve what God’s will is—his good, pleasing and perfect will~Romans 12:1-2. …whatever is true, whatever is noble, whatever is right, whatever is pure, whatever is lovely, whatever is admirable–if anything is excellent or praiseworthy–think about such things,~Phillipians 4:8. Watch and pray so that you will not fall into temptation. The spirit is willing, but the flesh is weak,~Matthew 26:41. It is true there is evil in the world that impacts the soul and body. Yet our mind requires renewal. Our emotions need the work of the Holy Spirit. Our wills need to be submitted to God. We can still choose to sin after being saved. Our bodies still need to be Spirit led as well. The Bible is very clear, sin brings destruction and death. It’s like a cancerous poison. There’s nothing good about it. I’m going to give some illustrations so hope it will be fun and interesting (maybe). Let’s suppose you have a shack in the woods. It’s pretty beat up and dead looking. One day a man knocks at the door and says, “Can I come in? I’d love to live here with you and turn this shack into a mansion?” You may think, “What’s the cost?” He smiles at you and shows you His credentials. He’s a King! The King of all Kings. After listening and seeing the enthusiasm in His eyes, you agree to join your life with His for life. At that moment He looks around and sees there are so many doors, rooms, filled with who you were before. Some are dark. Some are filled with pain. He smiles because His vision is the best vision. The old you disappears and the new you stands before Him. Your shack becomes a new building. You still look the same on the outside. Some of the rooms still look the same. Yet some are gone. Your place is no longer a dead looking shack it has life. He’s there, this King with you. I like how C.S Lewis put it. You notice over time He’s moving stuff around. There’s transformation happening in your mind, emotions, and will. 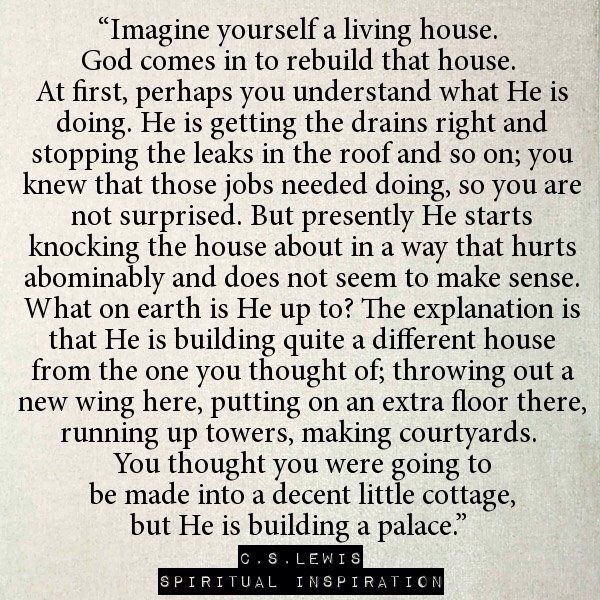 As you spend time with Him you are growing to want to be like the Master Builder. He’s pulling stuff out of the rooms that aren’t like Him. If a person had demonic oppression, addictions, emotional problems, ancestral issues, strongholds, soul sickness, etc…at conversion, that does not mean those rooms in their soul are immediately cleaned out. For some people things are broken off instantly; for some they are broken off as they are delivered. I call deliverance house cleaning/inner healing. I had someone tell me the soul was saved so it could not be impacted by an evil spirit. This is not true. I will address in another post in more detail about oppression. Here’s a testimony from my life. I’ve had many traumas in my life. Won’t bore you with them all. I will tell you about my battle with fear. There’s healthy fear (of the Lord, the body’s natural fight or flight to real danger). And there’s a spirit of fear. It’s an evil spirit that comes to torment, harrass, hinder, bind, and constrict. God’s perfect love casts out fear (1 John 4:18). There’s no need to cast out something that’s like God, right? So fear, like all evil spirits, is an intruder. He tries to set up a room in your soul (mind, emotions, and will) to bring turmoil into your life. I recall when fear entered by life. It was the day I was taken from my adopted parents and placed back with my biological mother. It was one of the most traumatizing moments of my life. Fear came in and set up shop. I became afraid of so many things. Later in life after breaking off a relationship that man threatened my life. I knew he had partnered with a spirit of rage and the fear in me increased. A year after that I was in a car accident trapped under water, the people who saw the accident left me to die. 911 never came for me. Fear increased to the point of panic attacks and the inability to be in enclosed spaces. The room marked fear was taking up more and more space. Add to that being under a program manager and manager who bullied and harassed me for years without help from Human Resources. Church people who turned on me…and well that room was massive. I did not function normally. I continually thought, “Something bad is about to happen.” Did I have the Holy Spirit? Absolutely. Was my soul sick and oppressed by an evil spirit? Yes! Much of my life story is God shows up and does the deliverance. I’ve been blown off by a few Christians and some, though well meaning, had zero clue how to help me. But God knew. One day I was crying out to God for relief from panic attacks. He touched me that day. It was like fire ran through my body and I never had another one. For the other things, fear of loss, persecution, rejection, etc…those were all tackled in process. I would soak in God’s love. I asked for belief of His word as unbelief opens the door for torment. I had some inner healing with trusted mature Christians. That room marked fear has been infiltrated by the incredible love of God. He continues to purge out what’s not of Him! He’s so good. There are rooms there at conversion and some we open after accepting Christ that bring torment, addiction, or oppression into our lives. Idolatry (worshipping anything or anyone other than God). Sins that are committed against us or traumas can also open doors in our lives. I recommend starting with God. I ask God to work in my foundation and purge what’s not of Him. I ask the Holy Spirit to reveal any lies I’ve come into agreement with or to reveal any hidden idols of my heart. I ask so I can renounce lies and confess my sins before the Lord. Father may we yield our entire lives to You! I pray Your love saturates the heart of each person. May we invite you to clean house. May we surrender every lie we have believed to You! May we renounce partnership with any lie. Forgive us for our unbelief. Replace it with truth and faith. In Jesus powerful name, amen. Blessings & love to you!